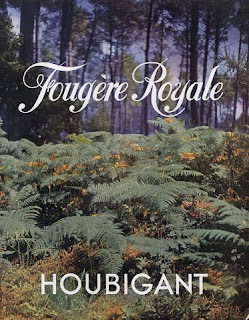 It is a truth universally acknowledged, that the reissued/reformulated version of Fougère Royale by Houbigant has little if any to do with the 1882 original. I've heard several fragonerds who are familiar with the classic Fougère Royale lament this fact and do the usual kvetching for which we are known. But since I never had the chance to try this classic Houbigant in any incarnation other than the current one and can't compare, I have to tell you that Fougère Royale, the one you can go and buy at Neiman Marcus, is pretty fantastic. I love green scents in general and fougeres in particular, so it's not like I had low expectations. The very opening of Fougère Royale was a bit worrisome to me. It has that nose-singeing quality of many a men's cologne, where they pile up the bergamot and add so much harsh lavender you can practically see the cheap barbershop. I don't know why anyone thinks this is what men want, but what do I know? In any case, it gets better very quickly once the sharp fumes and my nose hair are all gone. Fougère Royale is green in the best possible way. It's like a carefully prepared and very balanced herbal tea, with all the good stuff, from chamomile to geranium (love!). There's nothing wimpy about this tea: it has a bite and a true and very realistic leafy presence. The sophistication of this Houbigant fragrance comes from floral heart of Fougère Royale. Geranium is the perfect castmate for rose, and this perfume is no exception, while carnation lends an extra spicy touch. It's still a masculine fragrance, don't worry, but it's also interesting and wearable for women who are not afraid of the green side. The dry-down of Fougère Royale is pleasantly ambery without going all the way towards sweet. The official notes include patchouli and oakmoss, which suggest a chypre, but let's face it: Fougère Royale is a modern perfume for the 21st century, when our perfumed lives are dictated by IFRA, so whatever oakmoss they used, it's not enough to hit that particular sweet spot. 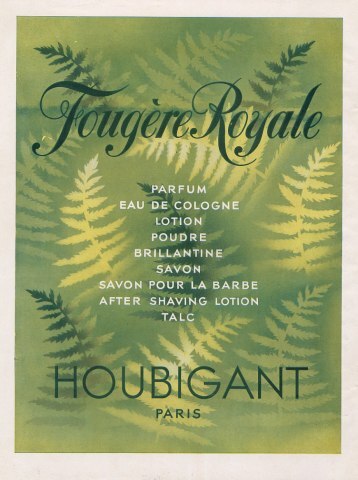 Still, Fougère Royale is satisfying, long lasting and wonderfully wearable. Notes: Bergamot, Mediterranean herbs, lavender, chamomile, rondeletia, geranium, rose de Mai, cinnamon, carnation, amber, oakmoss, patchouli, tonka bean, clary sage. 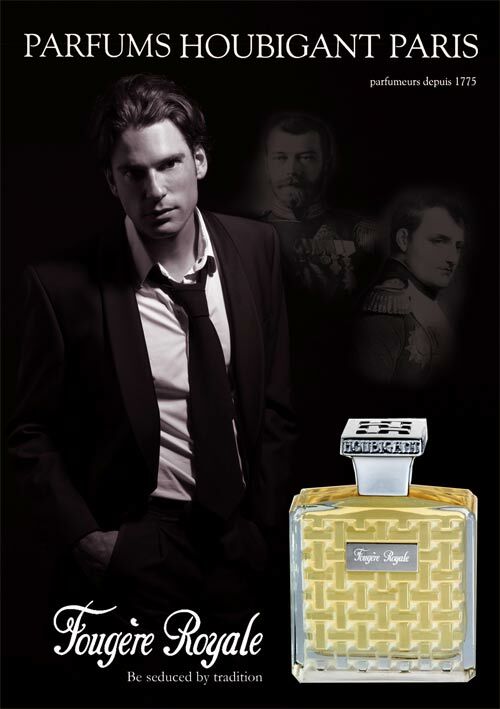 Fougère Royale by Houbigant ($170, 100ml) is available at Neiman Marcus online and in store, and also from Luckyscent. There's a parfum version in an elaborate black lacquered wood box priced at $600, but seriously. 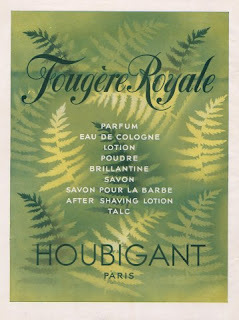 Ads for vintage and new Fougère Royale from hprints.com. Wow, that price tag is pretty amazing! I am loving the first advertisement, which has that kind of dashing, Errol Flynn-like appeal popular in the 1940s. Can you imagine such an image now? BTW, I am delurking. I have been reading your blog for years, primarily poaching lipstick hints. We like and own many of the same lippies. I have to delurk here. I've long been a fan of your blog and you have steered many a lipstick purchase. The retro advertisement is a delight! What a model of Errol Flynn-like masculinity, circa 1945! Imagine such a thing today. Oh, wait, you have given us today (or something close to it). That boy has his tie untied. Oh, the horror! I also like a Fougere. And a Vetiver, and and and. 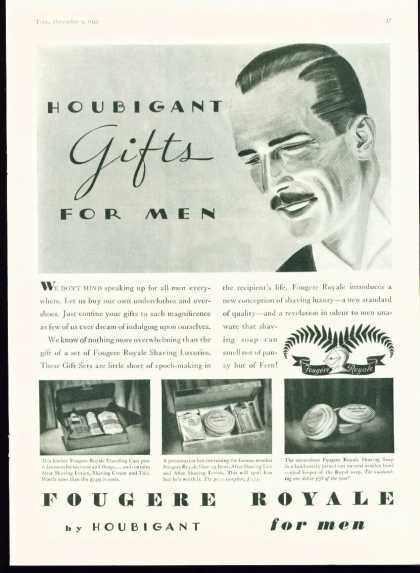 I love Fougere's, and this one is one of my favorites. I've never tried vintage or pre-reform, but perhaps it's good I don't know what I'm missing. Anon, some Nordies carry Fougere Royale, I discovered it in the Hillsdale Shopping Center Nordies in Northern CA.